Thanks to an ingenious tweet from Jillian Harris, these crunchy ‘dessert croutons’ were born. What better way to make use of your leftover banana bread than by chopping them up and tossing them in the oven for a good 20 minutes on 250F? After a stint in the test kitchen today, it became official. 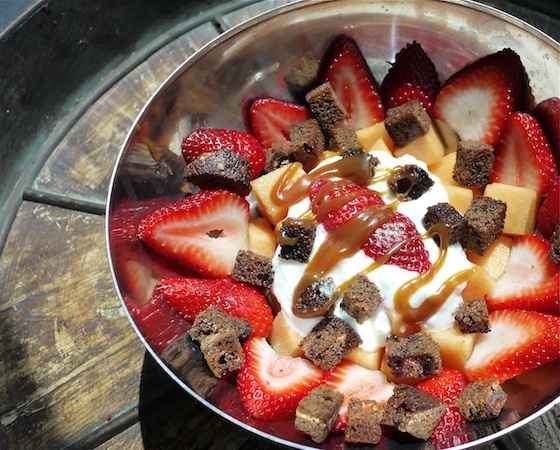 To Die For Banana Bread croutons are an excellent addition to fruit salad. Spruce your dish up even more with a few dollops of yogurt and a drizzle of salty caramel sauce (recipe here via thesparkle.net).